All our solid and and made-to-order engineered wood floors are manufactured at our factory here in Yorkshire and supplied throughout the UK. All the timber we use is sustainably sourced and we apply an ethical approach to all aspects of our production process. 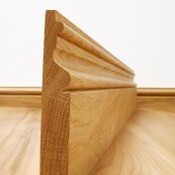 Supplying sawn, calibrated and planed oak and other kiln-dried hardwoods. • Cherry, Maple and more! Based in West Yorkshire within easy reach of the surrounding areas of Leeds, Bradford, Harrogate and York. Browse our range of real wood floors and see the different grades and finishes we offer. 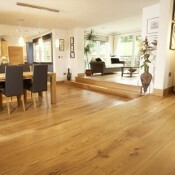 At British Hardwoods we are passionate about wood and how it can be used to enhance your living environment. We hope that the hardwood products you buy from us will become part of your everyday life for years to come. We firmly believe that using wood in your home shouldn't cost the earth, which is why all the raw timber that we use is sourced only from FSC or PEFC certified suppliers - helping to protect this valuable resource. 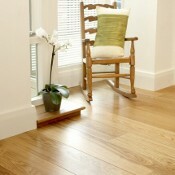 Our beautiful wood floors, skirting boards and timber are only part of an extensive range of hardwood products. Our solid oak farmhouse doors add the perfect finishing touch to any design project, as do our stunning waney-edged oak window boards. 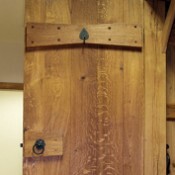 We supply oak beams which can be used as structural supports or simply for decoration. 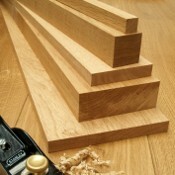 Our hardwood worktops are made to order and are supplied in full-length staves. We also stock a huge range of ancillary products for fitting, finishing and maintaining anything in wood. "A first-class service! I visited the showroom before ordering PAR European Oak. It was a very different experience to the way the amateur woodworker is treated in most timber yards - I was very impressed with the care with which my questions were answered and the trouble taken to order the lengths of timber that I actually needed. The oak was delivered on-time, packaged as others have described and is of excellent quality. I also attended an open day at British Hardwoods and picked some calibrated oak boards at a ridiculously low price, again of excellent quality. Highly recommended." "I plan to use these to clad over a rather hideous artex ceiling in my living room. The super thin planks are perfect for this, the thicker ones will be perfect for my husband to make some furniture, I will definitely be purchasing again (45m2 of ceiling to cover!)." "Communication from the firm was first class, first verifying by phone the specified lengths that we had requested before proceeding with the order. Thereafter a delivery date was given and adhered to. The product is first class, fumed and oiled, evenly coloured and securely packed for transport. We won’t hesitate to get back in touch should we need any further wood. Thank you guys." "British Hardwoods supplied us with 250 sq m of engineered oak flooring and also supplied us with bespoke lay made risers and treads for our wide staircase. In the large area that we covered it was essential that we had long wide boards and not lots of random small pieces that comes in some of the packs from the cheapest suppliers. Thanks also for the very helpful advice from the sales office."